Dating is hard enough without running a business at the same time. Here's how to cope. Meet Michael Stajer. By all accounts, Stajer has it all: He's attractive, single and owns a multimillion-dollar company in Oakland. Sure, Stajer has no problem landing a first date, but subsequent dates and a relationship are more difficult to navigate. So what's the problem? Simply put: He owns a successful company. "I have definitely lost relationships because I'm a business owner," says Stajer, 33, CEO and founder of WineCommune.com, an online retailer of wine that operates under the brand JJBuckley.com. Stajer attributes long hours, high stress and the struggle to find work/life balance as a thorn in his otherwise flourishing dating life. The same thorn has troubled Tyler Barnett. As the owner of a successful Los Angeles PR firm, Barnett Ellman, he has no problem meeting women. It's what he does after he meets them that's the issue. "It's taken so much time, emotion and energy to get this business started, that I find I don't have that [to give] on the dating side," says Barnett. "I've gone on dates, but there's something always kind of missing from my personality that girls I dated noticed--and it was that I didn't have the energy to commit myself to a relationship and to the business." Stajer and Barnett aren't alone. Many entrepreneurs run successful businesses, but can't manage successful dating lives. The bookstore is full of countless dating guides, but they contain little advice for the busy entrepreneur, who must play the dating game by a different set of rules. "It's tough to run a business and have time to date; it takes a lot of coordination," says Amy Schoen, a dating and relationship coach who understands the difficulty of dating as a busy business owner. She was one herself when she owned a women's clothing store, was single and looking to get married in her late 30s. Schoen threw herself into the dating jungle and came out on the other side with a husband and a new career helping other people meet the right person. In her new book, Get it Right This Time: How to Find and Keep Your Ideal Romantic Relationship, Schoen shares her tips on how to date like an entrepreneur. Put your personal time on your calendar--and stick to it. You make time for your clients, employees and everyone else--why not yourself? Make an appointment with yourself on your calendar and stick to it. Figure out how many hours a week you're willing to commit to your personal life--including dating--no matter how difficult it is. "I can't tell you how many times someone has said, 'There's a happy hour at 7:00' and I think, 7:00? How can you be out of work at 7:00 and make a happy hour?" says Stajer. Schoen says that you need to apply the same time-management skills to your personal time as you do to your work time. "If you're not making time for dating and relationships, it's not going to happen," she adds. Be very clear on your goals and priorities--with the person you're dating and with yourself. What do you hope to accomplish with dating? Are you looking for a serious relationship or are you just having fun? Schoen suggests ranking the following priorities in order of importance: work, family, finding a life partner and getting married, community service, athletic activities, and personal/social activities. Be honest about what comes first in your life and date accordingly. Tanya Marchiol, 33, knows exactly what her goal is. "I've learned over the past nine years that it's really difficult to have both [a career and family]. Now my mindset has shifted from perfect wife, perfect kids and white picket fence to really having an empire in my business and having somebody being able to fit into my life." Marchiol is president and founder of Team Investments. As a former pro-volleyball player, she helps other athletes make educated decisions about how to invest in real estate. She's constantly surrounded by men, but is honest about the fact that her business comes first; finding a partner comes second. 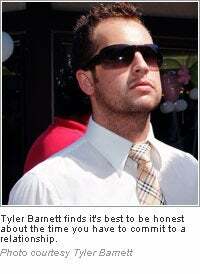 Barnett also has learned that honesty is the best policy when it comes to dating as a business owner. "I made it very clear--maybe to the point that it was offensive--that my business comes first," says Barnett of his current relationship. Now, looking back, Barnett says if he had heard that same thing from someone else, a comment like that would have been a deal-breaker. "It's very difficult to put that in a way that anybody understands." Decide what tradeoffs you're willing to make. What are you willing to sacrifice? For Schoen, she realized that if she wanted to devote more time to finding the right person, she would have to hire extra people to take care of some of the menial tasks, such as bookkeeping, to free up her time for dating. Hiring more people meant making less money, but the tradeoff for Schoen was worth it. Even if you bring in help seasonally, it could free you up for a vacation or a long weekend. Just like with your business, set a dating budget. What are you willing to spend on internet dating, social events, or even a coach or dating service? Don't feel the need to showcase your success by spending money you don't have--or even money you do have. "As you move up financially, you don't need to pretend to be more successful than you really are," says Stajer. "Your first dinner doesn't have to be a $200 a plate dinner--and it shouldn't be." 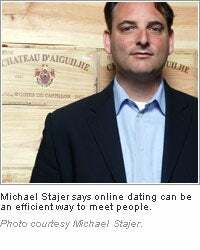 Stajer's biggest dating obstacle lately has been recognizing the women who are interested in him--and those who are interested in his social and financial position. "You'd be surprised by how many of those women are around," he says. Put yourself in a place where you can meet similar people. "Internet dating is a big thing, and it can be very time efficient," says Schoen. "It allows you to zone in on the types of people most likely to share your values and interests." 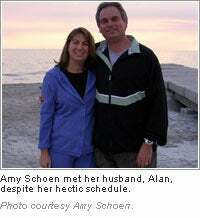 Stajer found success on Match.com, where he met and dated a woman for four months. "It was a great way to meet people when you don't have time to go out." Several dating sites exist especially for entrepreneurs and busy professionals, including TableForSix.com, ItsJustLunch.com, EntrepreneurDating.com and BusinessSingles.com. Schoen also suggests combining fun and recreation, such as singles cruises and group activities that put you in contact with people who share like interests. She provides a full list of dating resources, including websites, singles travel groups and dating directories, on her site, HeartMindConnection.com. Lastly, don't underestimate the benefits of networking. "I don't think entrepreneurs realize they have a lot of good chances to meet other people by going to networking events and conferences," says Stajer. "There's a camaraderie there when you meet other people in the same industry," adds Marchiol. "There's an instant bond."